Value investing has had a rough time of late. Which means now might be the perfect time to read up on value investing. Tobias Carlisle in The Acquirer’s Multiple: How the Billionaire Contrarians of Deep Value Beat the Market goes into depth about how to calculate a margin of safety, mean reversion, quantitative measures of value and the role of activist investors. Toby has been a regular visitor here at Abnormal Returns with Q&As on his books Concentrated Investing and Deep Value. Carlisle has also been on a podcast tour of late speaking with Jesse Felder and Meb Faber. You can also check out an excerpt from the book. Below you can find my questions in bold. Toby’s (unedited) answers follow. Enjoy! AR: Maybe one of the most interesting things about Warren Buffett is his evolution of an investor. (It obviously helps to have been at it for 60 some years). Even after all this time are we still understating the influence of Charlie Munger on Buffet and Berkshire? TC: No. If anything, we’ve forgotten Graham’s influence on Buffett, or even Buffett’s own genius. When Buffett bought Apple last year, it was one of the cheapest large capitalization stocks in the US according to the Acquirer’s Multiple. You didn’t need to have a view on Apple’s business or its ability to grow and compound. It was simply mispriced. Buffett has said he is 85 percent Graham and 15 percent Fisher, and his actions still bear that out. AR: Speaking of investing evolutions, the Joel Greenblatt is a fascinating one. Like Buffett, Greenblatt was a super-successful, hedge fund manager who ends up making a big career transition into quant-driven, liquid alt fund manager. What do you take away from Greenblatt’s career arc? TC: I’m a huge fan of Greenblatt’s. I very much admire that one of the most successful hedge-fund managers to walk the planet has become such a booster of behavioral investing. Like Buffett and many other great investors, Greenblatt simply had too much money to invest in his special situations strategy. His Magic Formula offers a sensible way to beat the market over the long term without the same limitation. Of course, for the reasons I explain in the book, I think my approach is better, but not all the time and not in all markets. And I owe a great intellectual debt to Greenblatt. AR: There has a been a great deal written about how private equity returns can be replicated with some combination of small value, leverage and some return smoothing. My contention is that the illiquidity inherent in private equity makes it more likely investors will actually be able to realize these returns. Isn’t the situation with the TAM similar, i.e. that investors are likely to be their own worst enemy? TC: Value investing is a difficult strategy to follow because it regularly underperforms, and sometimes it goes down while the market goes up. This phenomenon is called tracking error. And it’s the secret to returns for value. The point in time that value investors look dumbest is the best time to be a value investor. And value investors are looking pretty dumb right now with almost a decade of underperformance. AR: This might be my favorite line from the book: “A wide margin of safety is important because it gives mean reversion time to work its magic.” (p. 141) I had not really thought about how those two things work in hand-in-hand. Can you explain? I like to think of it as the idea in athletics that to finish first, you must first finish. Don’t blow up. Give the idea enough time and breathing space to work. Make sure the things could kill it aren’t present. The greater the company’s discount to its value, the bigger the margin of safety. A wide discount allows for the ordinary errors in calculations of value. And it allows for any drop in value. Make sure the company is solvent and liquid. Many, many businesses have been killed by too much debt. Make sure the company owns a real business with historically strong operating earnings with matching cash flow. Companies that own science experiments, or toys in search of a business model are for speculators. But weak current profits in a stock with a good past record creates a good chance for mean reversion. AR: One thing that many overlook about Buffett’s success is his fanatical aversion to paying taxes. Berkshire’s lack of a dividend being just one example, thereof. Your last rule in the book talks about maximizing after-tax returns. Why do we (collectively) minimize the role of taxes for most investors? TC: Taxes have a huge, hidden impact on investment strategies but they are difficult to model because each investor’s tax situation is different. High return strategies that generate lots of short-term capital gains are often less attractive than lower return strategies that generate mostly long-term gains (or have no tax impact) on an after-tax basis. For hands-on, taxable investors, good strategies should generate short-term losses in the current tax year and long-term capital gains pushed into the next year. For passive, taxable investors, being able to time your own tax events is also important. For both these reasons, mutual funds fall down and ETFs are much more attractive. AR: Thanks, Toby. Good luck with the book! 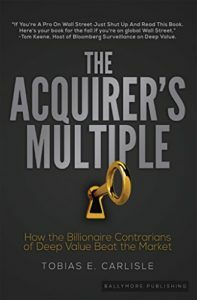 *Toby was kind enough to send me a copy of The Acquirer’s Multiple. You can also check out an excerpt from the book at The Acquirer’s Multiple site.